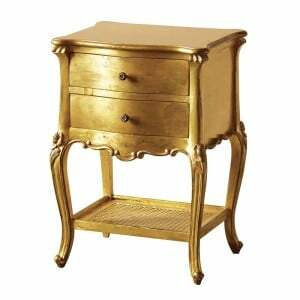 This lovely 2 drawer bedside table is carved from mahogany and features genuine gold leaf finish. With 2 drawers and low rattan shelf this is a practi.. This extravagant French dressing table is typical of the Rococo period of French furniture production. Opulent and ornate, our Keswick mahogany dressi.. 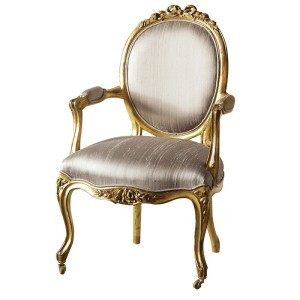 This silk button upholstered French armchair is carved from mahogany and finished in genuine gold leaf. Ths silk upholstery and scroll arms give this .. 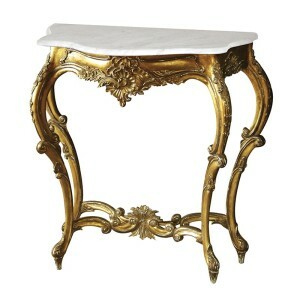 This French console table is carved from mahogany and features genuine gold leaf finish. The mottled brown/black marble top give this French console t.. 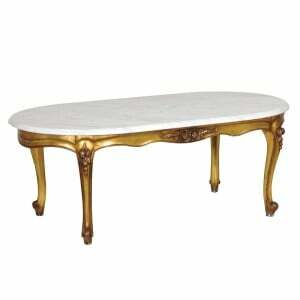 This French coffee table is carved from mahogany and is finished in genuine gold leaf. Featuring a mottled white marble top this French coffee table w.. This stunning French armchair is upholstered in a green and gold fabric. 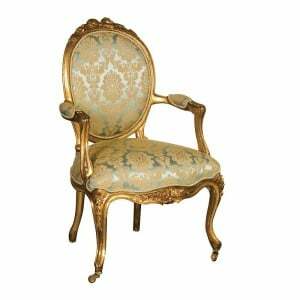 Carved from mahogany this French armchair is finished in genuine gold leaf. T..
Our Keswick Ribbon Armchair is carved from mahogany and is finished in genuine gold leaf. One of our most popular chairs this armchair is upholstered ..
Keswick Gilt Console Table with Marble Top. ..
Keswick Green/Gold 2 Seater Settee. ..
Keswick Green/Gold 3 Seater Settee. ..